The 2015 Budget is focused on the Australian Government’s plan to build jobs, growth and opportunity for all Australians. The Government is investing around $6 billion this year to support training that gives apprentices and vocational students the high quality training they need for modern Australian workplaces. This includes funding through the Government’s signature Industry Skills Fund to help employers to skill their staff so they can grow their businesses, increase exports and create more jobs. Young employed people will receive skills linked to real jobs, and support to be able to re-engage with work, training or school, through two youth training pilots, which are being trialled in 32 sites across Australia. From 1 July, the Australian Apprenticeships Support Network will match apprentices to their trade and their employer, and support them throughout their apprenticeship so they complete their training and go on to important work and careers. The 2015 Budget also provides $1.8 billion to continue the Government’s significant funding to states and territories to support their training systems. This year more than 1.5 million students will gain important skills and nationally recognised qualifications through assistance provided to Australia’s high quality TAFE, community colleges and private training providers. Read more about the 2015 Budget measures that support the Government’s significant VET reform agenda. On 8 May 2015, Senator the Hon Simon Birmingham, Assistant Minister for Education and Training, announced the establishment of the Australian Industry and Skills Committee (the Committee). The new Committee has been established to provide effective industry leadership to the vocational education and training (VET) sector in Australia. The establishment of the Committee is part of the Government’s agenda to streamline and strengthen the effectiveness of governance arrangements and give industry a greater role within the decision making processes for the VET sector. The Committee will provide industry-based advice to governments on strategies to lift the quality and relevance of training. It will also play the critical role of overseeing qualifications and training product development, ensuring Australian workers are provided with industry-relevant skills that meet the future needs of employers. Please read the Assistant Minister's media release for more information. 2015 SEE and AMEP Forums a great success! Between 28 and 30 April 2015, over 150 service providers for the Skills for Education and Employment (SEE) programme and Adult Migrant English Program (AMEP) came together to hold a series of forums at the National Convention Centre in Canberra. Delegates discussed the future directions of both programmes and participated in presentations and workshops exploring best practice, innovative training delivery approaches and recent research to ensure students are receiving the best training available. The Assistant Minister for Education and Training, Senator the Hon Simon Birmingham, opened the AMEP forum. Senator Birmingham talked about the importance of foundation skills, including literacy and numeracy skills, in achieving social and economic success. Lisa Paul, Secretary of the Department of Education and Training, provided the opening address at the SEE forum. The co-location of both programmes in the one department allowed the 2015 SEE and AMEP forums to be held consecutively for the first time. This gave providers, adult education experts and peak industry bodies for both the SEE programme and AMEP the opportunity to come together to explore the commonalities, differences and relationship between the two programmes both now, and into the future. SEE and AMEP together deliver more than $370 million in training a year. SEE provides language, literacy and numeracy training to eligible job seekers, while AMEP provides free English language tuition to eligible new migrants and humanitarian entrants. The forums were a great success. Participants highlighted the content and opportunities to bring everyone together as invaluable, along with taking away useful and innovative ideas to assist in the future delivery of both programmes. Senator Simon Birmingham, the Assistant Minister for Education and Training, met with students at Holmesglen Institute’s Chadstone campus on 19 May 2015. The first in a series of consultations with VET students, this session allowed the Minister to hear first-hand from students about their VET experiences and expectations, as well as their concerns about the sector. Over the session, a number of themes were identified and discussed, including the difficulty people have in finding information about the training pathways that are available to achieve the job they want, how useful information about the quality of providers would be when trying to deciding where to study, and student concerns that the courses they were studying were not delivering the desired balance of theory and practical elements. Other topics discussed included the need for specialist facilities for some courses and class sizes. The session was facilitated by Kathryn Shugg of the VET Reform Taskforce. The discussion was interactive and engaging, and the Minister appreciated the students giving their time and sharing their views. Further student consultations are expected to be held in the coming months. Information on these will be provided in future editions of Skills@Work. Thanks to the good work of many training organisations, employers, parents and students, more than 2 million Unique Student Identifiers have been created to date. This marks an important milestone in the implementation journey since USI requirements came into effect on 1 January 2015. Creating a USI is the first step to providing access to a lifetime VET record and making information transfer in the training sector faster and more efficient. The process for creating a USI is free and easy, and an important feature of the scheme is the ability for students to create their own USI online. The overwhelming majority of the USIs were created by students on their PCs, laptops, tablets and smart phones! Most Registered Training Organisations (RTOs) have already connected with the USI Registry System by completing the Online System Access Request Form. RTOs will need to collect and verify a student’s USI before conferring a qualification or statement of attainment unless a specific exemption applies. This is required to meet national reporting requirements. RTOs will need to connect to the USI Registry System to VERIFY USIs even if they are not planning to create a USI on the student’s behalf. Stay up to date with the latest news on the USI via the website. You can contact the USI Office for further information via the chat function. Alternatively, you can call 13 38 73 or email the USI Office. After two years of intensive training and competition, WorldSkills Australia has officially announced the names of the 25 competitors comprising the Skillaroos team – a talented group of trades and skills apprentices, trainees and students who will represent their country at the 43rd WorldSkills Competition in Brazil this August. The international WorldSkills Competition occurs every two years and is the biggest vocational education and skills showcase in the world. This year’s competition will see 59 countries represented by 1,176 experts and over 1,200 competitors competing in 50 skill categories. Held from 11-16 August 2015 at Anhembi Exhibition Centre in São Paulo, Brazil, the competition will utilise 213,000m² of competition space – equivalent to the size of 17 Olympic sized swimming pools. The Skillaroos will compete in 23 skills categories in the hopes of taking home a gold medal for their country. WorldSkills Australia will host a Farewell Function for the Skillaroos on 4 August 2015 at Turner Hall, TAFE NSW Ultimo College. More information on the Skillaroos and the Worldskills Competition can be found on the WorldSkills Australia website. The East Asia Summit (EAS) TVET Provider Network seeks to promote the value and importance of TVET across the 18 EAS countries. The Network’s overall aim is to build and support the capacity of TVET providers by facilitating the exchange of ideas, knowledge, expertise and experiences in developing technical and vocational skills across EAS countries. There have been two Annual Conferences of this Network since it was formed in 2012: the first in South Korea in 2013 and the second in Malaysia in 2015. We have created a survey to evaluate its progress through hearing your thoughts on the Network, how it could better benefit you and what would encourage you to join. If you deliver training and are interested in international collaboration, we encourage your participation in the survey at SurveyMonkey. The survey will close on 21 June 2015. Your responses will shape the direction of the Network, helping it to better serve training providers across the EAS region. Your answers will only be used for this purpose. More information on the Network, including information on past forums, can be found on the EAS TVET website. Please email InternationalSkills&VET@education.gov.au if you have any queries about the Network or the survey. 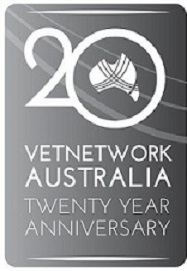 VETnetwork Australia will be celebrating its 20th birthday this September and will host two key events in Canberra to mark the occasion and recognise and celebrate the achievements of the last 20 years. A workshop focusing on the achievements of VETiS including pedagogy, professionalism, practice and process will be held on 17 September 2015 from 9 am to 4 pm. A dinner celebrating VETnetwork Australia’s achievements and acknowledging their supporters will be held from 7-10 pm that evening. This key event is a representation of the commitment and passion of VET practitioners to vocational learning and VET in a resolve to help improve the educational achievements of all young Australians. For more information including details on how to register, visit the VETnetwork website. Established by the National Commission of the People’s Republic of China for UNESCO, this award recognises the contributions of educators and institutions that have optimised the potential of education and the human innovative spirit to address and resolve pressing issues and problems facing our world today. Innovations for Skills Development for the Future, the 2015 Award theme, recognises innovative approaches that have helped develop the skills needed for the 21st century, demonstrated effective re-skilling and adjustment to skills mismatch, and contributed to productive and sustainable development. Individuals or institutions from UNESCO Member States in Asia and the Pacific region that have designed and implemented significant educational innovations leading to improved access to, and quality in, education and skills development will be eligible for the Award. Nominations close on 29 July 2015. Find details about the Award and the official application form on the UNESCO Bangkok Office website. A forum in Sydney on 27 May 2015 heard leaders from the Muslim and Indigenous communities speak about using the strengths of people from different backgrounds to build a stronger Australia. The forum was organised by the Construction and Property Services Industry Skills Council (CPSISC) to bring industry leaders together as part of an overall strategy for a skilled workforce for the future of Australia. Jihad Dib, Member for Lakemba and Member for the Australia Day Council for NSW spoke about transforming Punchbowl Boys High School into a high performing school with strong social and educational outcomes. David Liddiard, former champion NRL player and well-respected indigenous leader talked about his Recruitment and Labour Hire Business, part of his overall business to find hundreds of people jobs and encourage retention. Other speakers included Ro Coroneos of Lend Lease and Yassmin Abdel-Magied. Ro spoke of the Barangaroo Skills Exchange and the success of workers from different backgrounds through early intervention strategies. Yassmin, linked in from an oil rig, explained how she established Youth Without Borders to encourage young people to make positive change in their communities. Read the media release for more details of the forum. While women make up just over 50 percent of the Australian population, they are a sadly underutilised resource in manufacturing, making up only 18 percent of the full time workforce (27 percent including part time workers). In manufacturing trades their number is estimated at around 2 percent. MSA’s recently released report ‘Women in the Manufacturing Industry’ examines some of the barriers women face when seeking employment in manufacturing roles. Manufacturing urgently needs a more active focus on securing the participation of women in our workforce. Understanding why we are missing out on women is a critical first step. Download the report to find out more and enjoy the stories of three women in manufacturing in this month’s Faces of Excellence. Draft 1 of the SIT Tourism, Travel and Hospitality Training package is scheduled for release for public consultation and feedback in June 2015, with submission for endorsement to the Department scheduled for late 2015. All units of competency and their associated assessment requirements have been transitioned to meet the requirements of the Standards for Training Packages. The SIS Sport, Fitness and Recreation Training Package has been submitted to the Department of Education and Training for endorsement. This submission addresses the skills development needs for the Fitness and Community Recreation sectors, as well as cross-sector components. It has undergone extensive industry consultation and validation and a full external quality review which deemed the proposed training package compliant with these standards. View the Case for Endorsement and the submitted components. The review of Beauty training package components is approaching completion. A key change has been the merging of Beauty and Hairdressing training packages to form the SHB Hairdressing and Beauty Training Package. This package contains five Beauty qualifications and 43 units of competency and associated assessment requirements. The four week validation period on Draft 2 of the beauty components took place between 30 March and 27 April 2015. Feedback received during this period has been incorporated to form the final draft which will be submitted to the Department in late June 2015. The review of the SFL10 Floristry Training Package is nearing completion. Draft 2 saw the tightening of the entry requirements to the Certificate IV in Floristry and Diploma of Floristry Design to address industry’s concerns of learners progressing through qualifications without adequate experience. Validation of Draft 2 took place between 18 March and 28 April 2015. Feedback received during the validation period has been incorporated to form the final draft material of the SFL Floristry Training Package which will be submitted to the Department in mid June 2015. For more information on all training package news and updates visit the website, email trainingpackages@serviceskills.com.au or call 02 8243 1200. This series addresses key skills shortages in the Australian retail workforce—Merchandise Management and Online Retailing—to ensure our retailers remain competitive in a global marketplace. Series 1 - Retail Merchandise has drawn on best practice in buying and planning and has been facilitated by leading industry professionals and practitioners. Series 2 - Online Retailing draws on best practice instructional design for eLearning that will allow leaners to develop their skills in a highly practical and workplace relevant manner. Feedback from participants and their employers will inform the ongoing development of nationally recognised retail qualifications to ensure they deliver upon industry training needs. For more information, visit Service Skills Australia. The 2015 Environmental Scans provide an overview of the trends and developments affecting labour and skills requirements for the service industries as a whole, or specifically in Wholesale, Retail and Personal Services, Tourism, Travel and Hospitality or Sport, Fitness and Recreation. Environmental Scans can be downloaded from the website where you will also find support material, including snapshot flyers that outline the key findings of each industry sector covered by the scans. To keep track of the discussion generated by the release of the Environmental Scans, connect with us on social media through Facebook, Twitter or by searching #SSAeScan. SkillsDMC has started preparing for the next release of the RII Training Package which is planned for endorsement later in 2015. Draft amendments to a number of RII components are now available for viewing and/or providing feedback on the Continuous Improvement page of the SkillsDMC website. These amendments respond to feedback received through the RII Continuous Improvement register. a new Unit of Competency covering the deployment and initiation of blasts via Electronic Blasting Systems. As it is developed, draft material for the Continuous Improvement Plan will be posted progressively for review and feedback on the SkillsDMC website at Continuous Improvement Plan. For further information contact the Training Package team at trainingpackage@skillsdmc.com.au. Released as a free ePub for both Apple and Android devices, the FSK Foundation Skills Training Package User Guide is now available to download from the IBSA store. IBSA is pleased to announce the release of their Financial Services Workforce Development Strategy Extract and two Financial Services Workforce Development Case Studies for the Mortgage and Finance Association of Australia (MFAA) and Westpac. Download these publications at New Resources. This month enjoy the stories of three women who have chosen to train and work in manufacturing. Gemma Hartwig had worked in her family’s farm’s shed with her father and grandfather for years, but didn’t consider diesel fitting as a career until it came up as an industry she may be suited to following a meeting with a career counsellor. She decided to undertake a week of work experience with a local company, Ostwald Bros. Falling in love with the trade, she was thrilled to be offered an Australian School-based Apprenticeship. 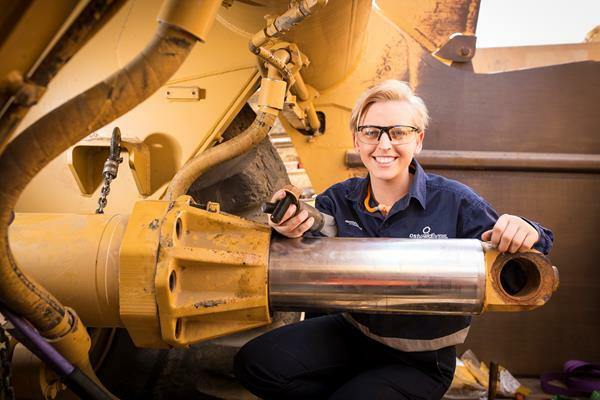 Gemma is now undertaking a Certificate III in Engineering at TAFE Queensland South West and completing her Year 12 studies at Our Lady of the Southern Cross College. Once her studies are complete, she plans to combine her trade with her rural knowledge through work in northern Queensland before travelling the world. Gemma was a finalist in the 2014 Australian Training Awards. She is an active member of her local community, the captain of her college and is involved in her local Lions club as well as cattle handling and judging. Rachel Dudok was in the third year of an engineering degree at university when she realised she wanted a more hands-on career. The Brisbane-resident started a pre-vocational training course for a Certificate IV in Aeroskills (Avionics) with Aviation Australia. 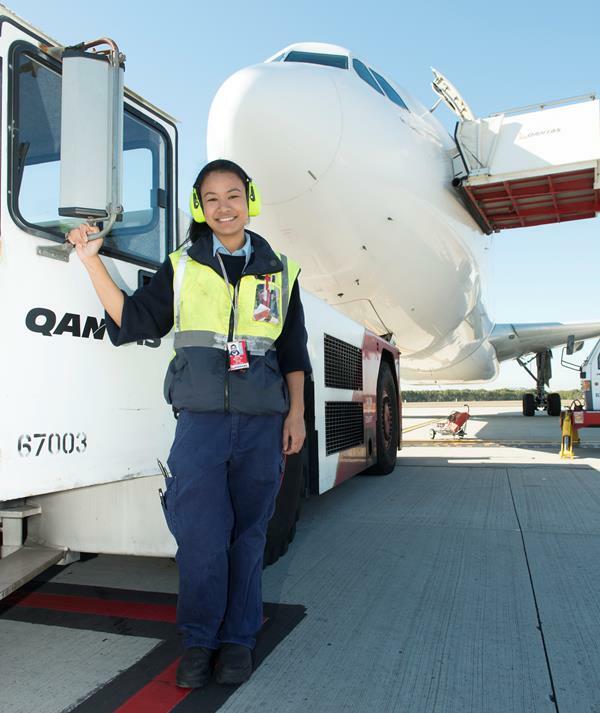 At the end of her training, Rachel was one of four avionics students to be offered an Australian Apprenticeship with Qantas. Rachel has completed an Australian Apprenticeship and a Diploma in Aeroskills (Avionics) through Aviation Australia, has internationally recognised qualifications and is employed as an aircraft maintenance engineer. The Australian Apprenticeships Ambassador also holds a CASA B2 license. Rachel has been an individual finalist at the Australian Training Awards twice - in the Australian Apprentice of the Year category in 2012 before winning the national Vocational Student of the Year in 2014. Melinda Lethbridge always had a fascination for hands-on work, but felt obliged to pursue a university pathway. After gaining work experience at Hargo Engineering, she decided that an Australian Apprenticeship in fitting and machining was a better option. 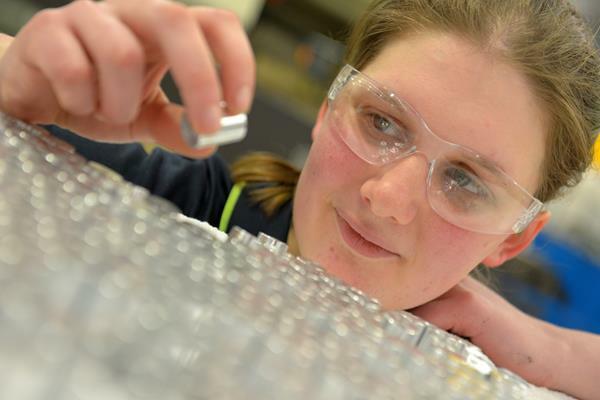 She enrolled in a Certificate III in Engineering – Mechanical Trade at Swinburne University of Technology and commenced her Australian Apprenticeship at Hargo Engineering the day after completing her school exams. As a qualified fitter and turner, Melinda won a gold medal in turning at WorldSkills Australia’s Melbourne Region competition in 2013, and also competed at the 2014 WorldSkills Australia National Competition. In 2014, Melinda was awarded the Australian Apprentice of the Year Award at the Australian Training Awards and became an Australian Apprenticeship Ambassador for the Australian Government. The sixth international INAP conference is being held in Australia for the first time at Federation University Australia (FedUni), Ballarat on 1-2 September 2015. The conference theme is Architectures for apprenticeship: Achieving economic and social goals and will address topics such as governance, school to work transition and youth employment and the status of apprenticeship as a career path. Keynote speakers include Raymond Patel, MerSETA, South Africa; Paul Comyn, International Labour Organisation, Geneva and Stephen Billett, Griffith University, Australia. The conference is being sponsored by the Commonwealth Department of Education and Training. Find out more information and register for the conference on the FedUni website. Keeping up with changes in NSW’s vocational education and training (VET) sector will be made much easier by attending the NSW Industry Training Advisory Bodies’ 2015 Conference. This year’s conference will bring together some of the most innovative minds, with top educationalists, leaders in business and government and industry representatives. With a mix of international and Australian guest speakers, this conference will provide strategies that can help facilitate stronger management and outcomes for teams or organisations. This year’s ITAB conference is essential for anyone wanting to stay competitive and up to date with VET policy and practice. Register or find out more here. Founder and CEO of the Institute for Workplace Skills and Innovation, Nicholas Wyman, will deliver a keynote address People Without Jobs and Jobs Without People: Bridging the Skills Gap at the 24th National Vocational Education and Training Research Conference 'No Frills' to be held in Sydney on 6 - 8 July 2015. Nicholas's presentation will look at the issues behind the often quoted “skills gap”. Drawing on his work with the organisations, governments, and educational institutions from around the globe who are pioneering the most cutting-edge solutions to the skills-gap problem, Nicholas offers a road map for how organisations, communities, and educators can come together to develop the human capital needed to keep our businesses innovative and profitable, our economy healthy and humming, and our nation sustainably competitive in today’s global economy. Co-hosted by the National Centre for Vocational Education Research (NCVER), University of Western Sydney and TAFE NSW's Western Sydney and South Western Sydney Institutes, the programme also features over 50 presentations on vocational education and training. For more information about the conference and to register, please visit NCVER’s 'No Frills' website. Registrations for the furnishing industry’s most prestigious annual event are now open for those wanting privileged insights into Australia’s furniture design and innovation future. FURNITEX connect will be held 9 - 12 July 2015 at the Royal Exhibition Building, Carlton Gardens, Melbourne. MSA is proud to announce that they will be hosting FURNISHING futures 2015 Conference as part of the event, in partnership with the Australian Furniture Association. The two-day programme includes talks, forums, networking and collaboration opportunities to ensure participants will go home well connected and equipped for the future. An exceptional list of confirmed speakers includes; Dr Bronwyn Evans, Standards Australia, Peter Roberts, Australian Manufacturing Forum, Dr Swee Mak, RMIT, Ben Batagol, Amaero Additive Manufacturing and Peter Mclean, Development Impacts. Read more details of the conference and register here. The Department of Education and Training will be conducting training for approved VET FEE-HELP providers throughout 2015. This training is suitable for recently approved or existing VET FEE-HELP providers that wish to refresh their knowledge. For more details and schedules of dates and venues please visit the department's website. A reminder that applications for the 2016 Fulbright Scholarship round will close on 1 August 2015. For more information on the Fulbright Commission and the scholarships, please visit the Fulbright website. The 2015 professional development calendars for training providers are available for NSW and SA. The Alliances are made up of a mix of sector-based and issues-based women's groups each with a distinct focus and a strong capacity for networking and advocacy activities. eS4W collaborates with these other Alliances on joint projects. More information on the Alliances’ model is available. Foundation skills resources now available from Aspire Learning Resources! If you would like to provide feedback, supply an article for inclusion in the next edition or join our list of subscribers, please email skillsatwork@education.gov.au. The next edition will be published in July 2015. Submissions are due by 17 June 2015.